Ambition can be a powerful force for good in our lives. But only if it is legitimate. Sometimes misinterpreted and often misunderstood, ambition — true ambition — is not a selfish quality. It is not another word for ruthless; it is not something to be shunned or subdued. Legitimate ambition is an honorable trait. At its very best, our ambition serves us and other people. In fact, pursuing your ambition is one of the most selfless things you can do. Enjoy the pursuit of your dreams! Enjoy the pursuit of your dreams! Ambition can be a powerful force for good in our lives. But only if it is legitimate. Sometimes misinterpreted and often misunderstood, ambition - true ambition - is not a selfish quality. It is not another word for ruthless; it is not something to be shunned or subdued. Legitimate ambition is an honorable trait. At its very best, our ambition serves us and other people. In fact, pursuing your ambition is one of the most selfless things you can do. 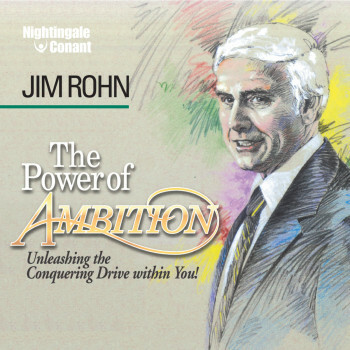 In The Power of Ambition: Unleashing the Conquering Drive Within You, renowned speaker and author Jim Rohn reevaluates the role of ambition in all aspects of our lives, exploring the facts, debunking the fiction and revealing the six life-changing steps anyone can take to build their legitimate ambition. Let Jim Rohn be your guide as you learn how to use your ambition not only to change what is going on around you, but what is going on within you.